Chorizo is a heavily spiced pork sausage originating from the Iberian Peninsula. 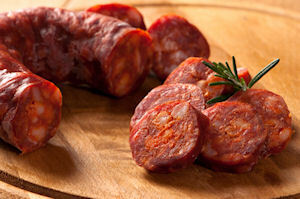 Predominately found in Spanish and Latin cuisines, chorizo is known for its distinctive smokiness and deep red color. Chorizo sausage can be fresh or smoked, depending on the region in which it is found. In Spain, the sausage is often fermented, cured and smoked and can be sliced and eaten without cooking, while in many Latin-American countries chorizo is a fresh sausage that must be cooked before eating and is often cooked along with other foods. Artichoke Recipes - Use artichokes in appetizers, soups, risottos and more. Corned Beef Recipes - Whether you are hosting a family get-together, or simply preparing a homey Sunday supper, we have a meaty recipe for you. Garlic Recipes - Delicious uses for this pungently flavored vegetable. Gumbo Recipes - Thick, meaty stew consisting of a hearty stock, meat or shellfish, and a thickening agent. Hummus Recipes - Tasty spread worthy of any dining experience. Pork Ribs Recipes - Barbecue, Chinese, Cajun and more styles of rib. Spanish Recipes - Cuisine from Spain including paella, tapas and more. Spanish chorizo gets its rich, red color from smoked red peppers and Spanish smoked paprika, and is made using white wine, while the many variations of chorizo found in Latin-American cuisine are often made using chili peppers and white vinegar. The spices used, flavor, and appearance of chorizo varies widely depending on how it is made, but all chorizo possesses a spicy, smoky flavor that is the perfect complement to many Latin-American and Spanish dishes.